After a dramatic car chase, casualties, and gun fire, police in Paris have reportedly closed in on the suspects in the Charlie Hebdo magazine, who have taken one or several hostages, with injuries also reported. On Thursday morning, gunfire was allegedly heard near Charles-de-Gaulle Airport in Paris, according to an unconfirmed report from the Air News agency. Other reports add that police have closed in on the suspects some eight miles from the airport. The airport has been partially closed while police conduct attempt to apprehend the terror suspects. Two of four runways have been closed at the airport as the operation to neutralize the Paris shooting suspects is underway, reported the media. Planes cross the Dammartin-en-Goele commune while approaching CDG airport. The suspects are holding one hostage, police sources told AFP. The Charles de Gaulle School in Dammartin-en-Goele is under lockdown as police have surrounded the town. Pupils were instructed to stay away from windows, said a high school student in Figaro. "Some students are crying," said another, adding that her friend was "terrified." France's interior minister, Bernard Cazeneuve confirmed an operation to detain suspects was underway northeast of Paris. 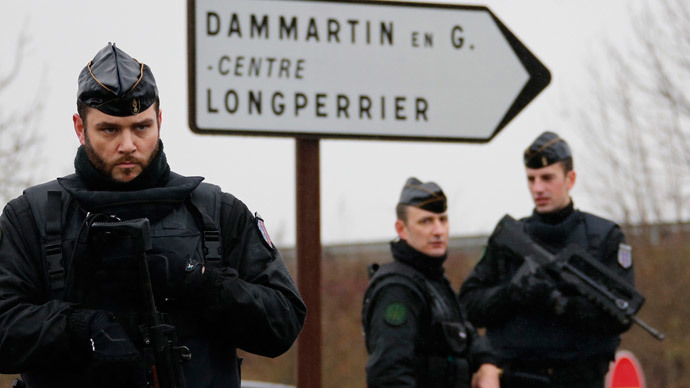 Security teams are being mobilized in Dammartin-en-Goele, he added. "Police forces are in place and the operation is being conducted minute by minute, led by the director general of the gendarmerie and the national police, the counter terror authorities and the Interior Ministry,” he added. Several schools, located close to the printing house where the suspects have been surrounded, have been evacuated, French media reported. The Henri Dunant primary school is only 300 meters from the printing facility. At least four French Air Force helicopters have landed nearby, reports say. Cazeneuve confirmed that the kidnappers are the Kouachi brothers, who are said to be heavily armed, RTL reported from the scene.The brothers are holding one female hostage, reported iTele. Yves Albarello , the deputy of Seine-et-Marne department, said the Kouachis "are ready to die as martyrs,” Le Figaro cites. After some 90,000 thousand security forces were mobilized nationwide, the manhunt to capture the suspects in the worst terrorist attack to strike France in a generation may be coming to a head. Reports have flooded French media about shots being fired in a number of localities, including the Seine-et-Marne area in northeastern France. Earlier on Thursday, the suspects had reportedly stolen a Peugeot in the morning in the town of Montagny, which is about 50 kilometers northeast of Paris. RTL reports that at least two people have been seriously injured in the course of events, though it remains unclear if it happened during or before the hostage-taking in Dammartin-en-Goele, a commune located 22 miles northeast of Paris. The Paris prosecutor’s office, however, has denied reports by several French media outlets that there were casualties in the shootout in northeast Paris. The hospitals in Dammartin-en-Goele are on high alert, and they are ready to receive patients in case any causalities result from the police operation. The suspects are later reported to have taken hostages at Création Tendance Découverte, a small company of about five employees, the city mayor said at a press conference. Police would later pursue the suspects down the N2 highway, which passes near the airport. Cherif and Said Kouachi, are accused of killing 12 people in Wednesday's attack on the satirical weekly Charlie Hebdo. The magazine had repeatedly lampooned religious and political figures, including the Prophet Mohammed. The shooting was France's deadliest attack in over 50 years. On Thursday, France’s President Francois Hollande ordered that security be tightened at vigils devoted to the Paris massacre victims, which are to be held on Sunday.